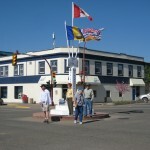 We spent the morning in Dawson Creek at the photo ops in town. There are actually two different “Mile 0” markers. 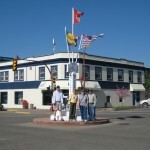 The original one, with the big sign over the top, is on the original spot of the beginning of the highway. 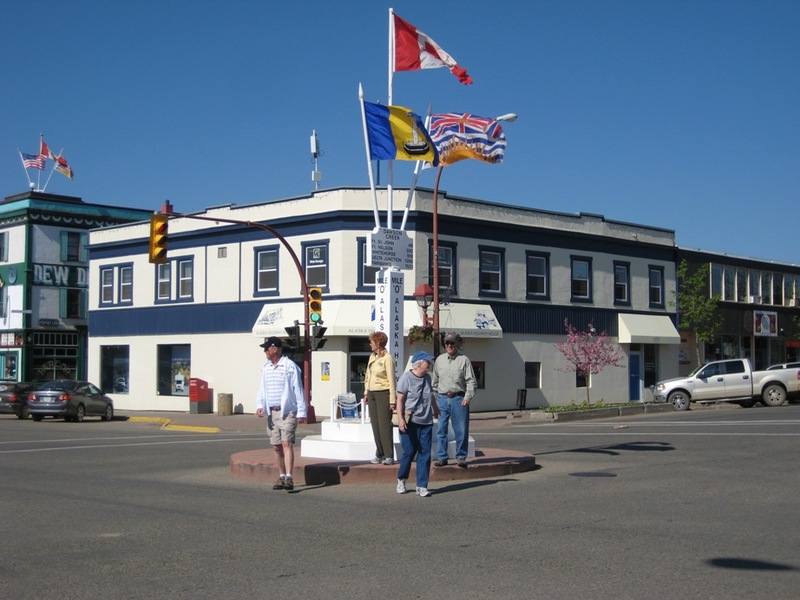 The second one, which is actually in the middle of the street in downtown Dawson Creek, was put up by locals thinking it was a better landmark. Actually the original landmark is more photogenic. They are within walking distance of each other. Today the weather is just beautiful as you can see from the photos. The temperature is moderate in the low 70s — really the best day we’ve had in a while. 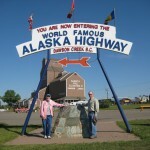 We went through the visitor center which had a brief movie showing how the Alaska Highway was built. It was actually approved and paid for by President Roosevelt, and was completed in the 40’s during WWII. The difficulties of building this road are legendary. The workers literally cut the road through the wilderness and at first it was gravel and dirt. Over the years the road has gotten better. 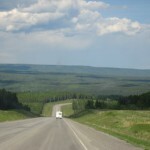 Today most of the highway we traveled was in good shape. 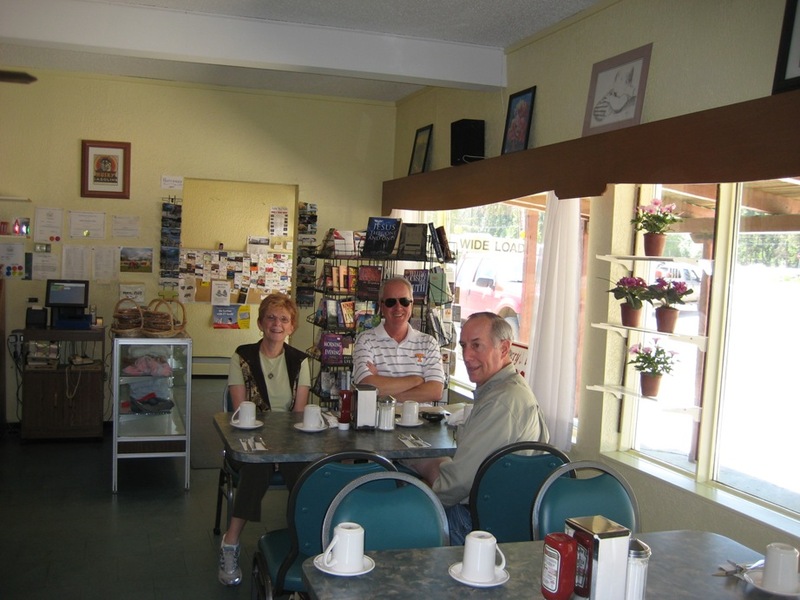 We stopped for lunch at a little restaurant called the Shepherd’s Inn which Don and Sandie remembered from their last visit. 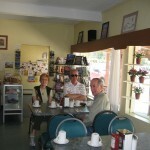 Sandie remembered their home made strawberry rhubarb pie. So after lunch we ordered pie—Sandie had ice cream with hers, and it was delicious. We paid $4.33/gallon today for diesel fuel, the highest so far on this trip. We were prepared to pay this for the fuel as we’ve been given plenty of information about it prior to us leaving home. 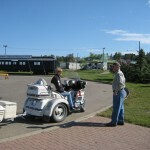 We arrived in Fort Nelson, British Columbia this evening and we are staying in the “West End RV Park”. It’s a nice litte park and we actually have full hookups PLUS cable, as well as good WIFI connection. I’m in hog heaven. 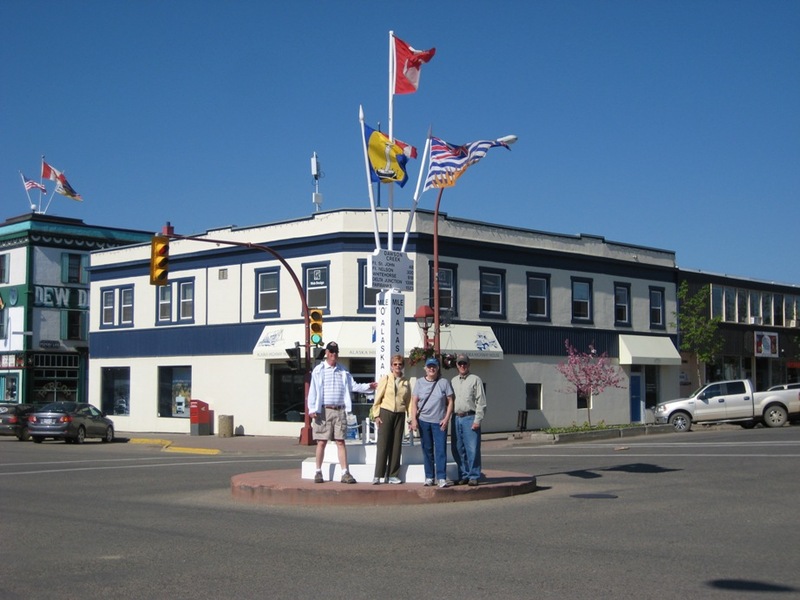 Tomorrow morning we’ll visit the Heritage Museum here in Fort Nelson, and then head out to the famous Laird Hot Springs, which is about 200 miles from here. Yes we’ll get in the hot springs as it is supposed to make us young. OK, well, that’s an exaggeration, but the springs should make us feel great. We are meeting so many nice people on this trip. 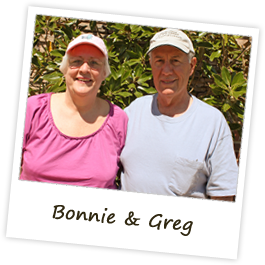 Travelers like us who are retired and tickled to be so. 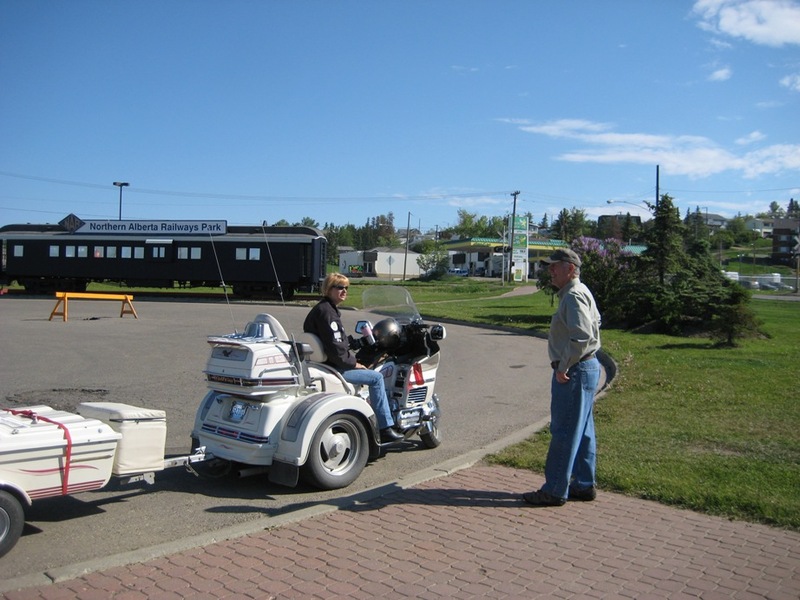 The biker chick in the photo is driving her own cycle. 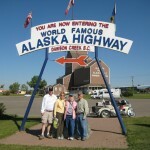 She and her husband and another couple (all on their own bikes) are returning to Spokane Washington after a trip to Alaska. She said it is much warmer up there so we are excited to hear that. 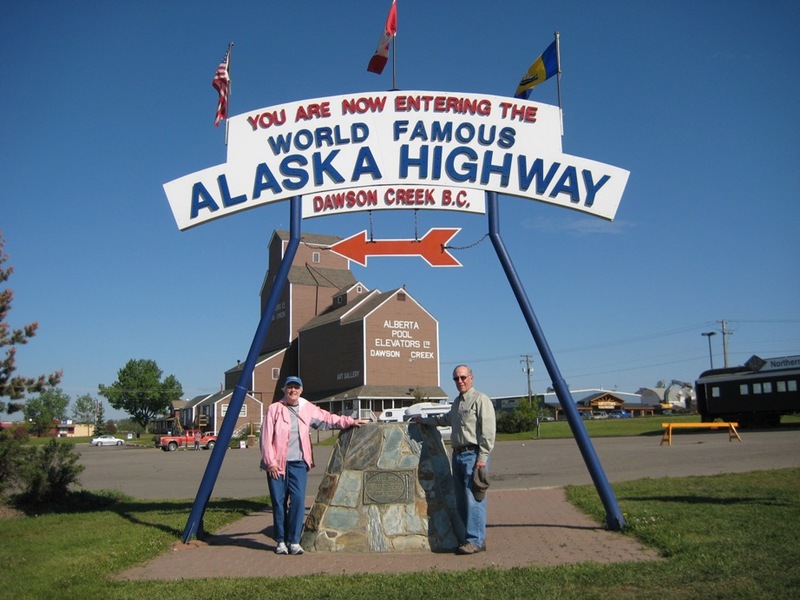 The Alaska Highway runs from Dawson Creek to Delta Junction Alaska and the entire length is around 1500 miles. 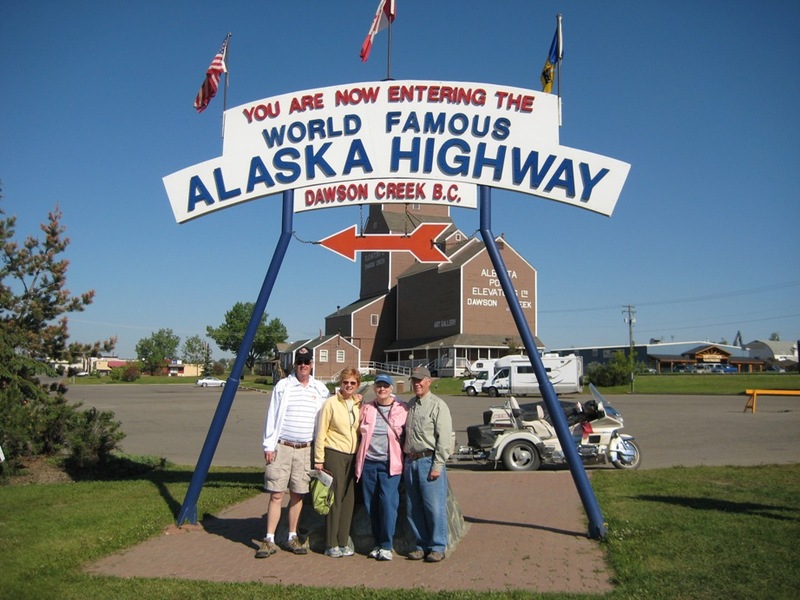 The key to have bragging rights about the Alaska Highway is that you drive the entire length of it from Dawson Creek all the way to Delta Junction, which we plan to do. 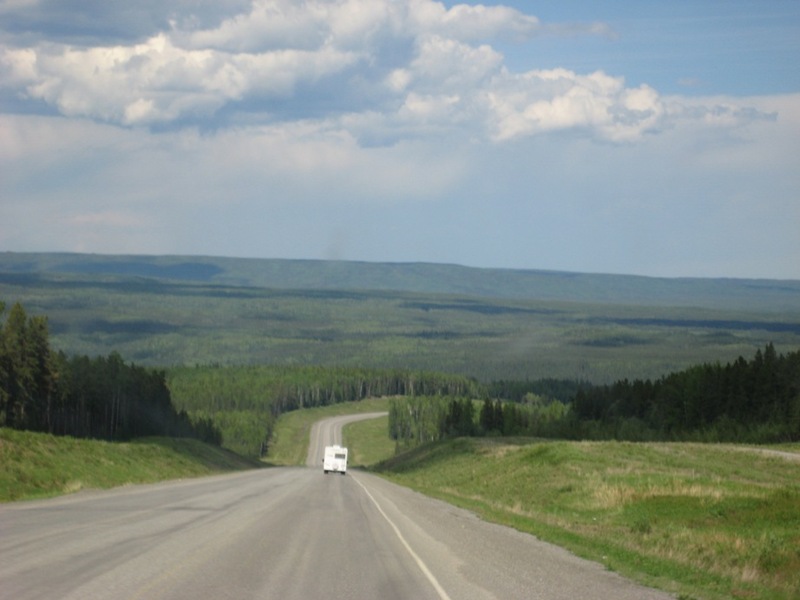 There are other routes you can take to Alaska, but the Alaska Highway is the way to go, and besides, you have bragging rights when you get there! So happy to see things are going well for you all. Everyday is just a new adventure and the pictures are awesome. Loved the Mama Bear and her Cubs. The weather looks incredible. It has been a VERY HOT HUMID DAY HERE. I think the high hit 94 with about 100% humidity. Stay safe and we look forward to your next entry. Wow you made it!! love the photos! We’re having a nasty weather weekend here in Cody..and the tourists are freezing..today will only reach 43 and it’s windy and rainy. Wind River and Big Horn mountains have a winter storm warning with 2-3 feet of snow! Aren’t you glad you’re not driving over the Big Horns today! Had some customers yesterday from Chattanooga! Georgia is right now, 97 degrees and heat factor of 105. It is awful!! Take care, enjoying the stories and pictures. Sandy and Don look wonderful. I bet it’s really nice meeting up with your friends. Already a month gone. I can’t believe it. Jeff and I, along with Shannon and her family will be going to the Outerbanks in two weeks. My entire family will be there. I can’t wait. There will be 22 of us. My niece rented a house right on the water with 16 bedrooms. Most of the children are over 10, except my grandbabies. It will be a wonderful week. Keep the pictures coming. I am loving it.